Ile de Pâques (Chili): Archaeologists shine new light on Easter Island statue Hoa Hakananai’a. A team of archaeologists from the University of Southampton have used the latest in digital imaging technology to record and analyse carvings on the Easter Island statue Hoa Hakananai’a. James Miles, Hembo Pagi and Dr Graeme Earl from the Archaeological Computing Research Group at the University of Southampton teamed up with archaeologist and editor of British Archaeology Mike Pitts to examine the statue at the Wellcome Trust Gallery in the British Museum, London. Hoa Hakananai’a was brought to England in 1869 by the crew of HMS Topaze. It is traditionally said to have been carved around AD1200. The Island is home to around 1,000 similar statues, but Hoa Hakananai’a is of particular interest because of the intricate carvings on its back. It is popularly believed that around AD1600 the Easter Islanders faced an ecological crisis and stopped worshipping their iconic statues. The Rapa Nui, as they are known, turned instead to a new birdman religion, or cult. This included a ritual based around collecting the first egg of migrating terns from a nearby islet, Motu Nui. The ‘winner’, whose representative swam to the islet and then back with the egg, was afforded sacred status for a year. Hoa Hakananai’a survived this shift in religious beliefs by being placed in a stone hut and covered in carved ‘petroglyphs’, or rock engravings, depicting motifs from the birdman cult. As such, it may be representative of the transition from the cult of statues to the cult of the birdman. The team from the University of Southampton examined Hoa Hakananai’a using two different techniques: Photogrammetric Modelling; which involved taking hundreds of photos from different angles to produce a fully textured computer model of the statue, capable of being rotated in 360 degrees; and Reflectance Transformation Imaging; a process which allows a virtual light source to be moved across the surface of a digital image of the statue, using the difference between light and shadow to highlight never-seen-before details. Using these techniques, Mike Pitts and the team made some fascinating discoveries, perhaps the most significant being the apparently simple recognition that a carved bird beak is short and round, not long and pointed as previously described: this allowed the two birdmen on the back to be marked as male and female, unlocking a narrative story to the whole composition relating to Easter Island’s unique birdman cult. 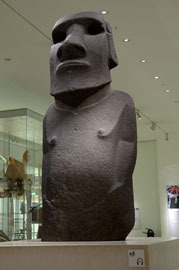 They also realised that the statue is one of the few on Easter Island that did not stand on a platform beside the shore. It is now believed to have always stood in the ground, where it was found, on top of a 300 metre cliff. • When it was half-buried by soil and food debris, small designs known as komari, representing female genitalia, were carved on the back of the head. • At a later date, the whole of the back was covered with a scene showing a male chick leaving the nest, watched by its half-bird, half-human parents – the story at the heart of the birdman ceremony, recorded in the 19th and early 20th centuries. • A round beak on the right birdman in the scene described above. This can be read as a sign of female gender, and confirmation of the male / female bird ‘parents’. The female birdman is matched by the female komari on the right ear of the statue, and the male on the left by a paddle on the left ear – a symbol of male authority. • A rounded shape near the lower part of the right birdman, possibly the egg the male chick hatched from. Another possibility is the ring clutched in the two birdmen’s arms has been re-imagined as an egg. • Faint indications of fingers around the navel, which may have once been more prominent, but later removed. It’s hoped the imaging carried out by the University of Southampton’s Archaeological Computing Research Group will open new debate on the significance of the engravings of Hoa Hakananai’a on display at the British Museum, which is visited by some six million people every year.